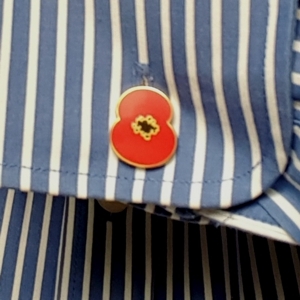 My wife bought me some poppy cufflinks, so I thought I should wear them today. When I was a child, most people wore poppies. Maybe one person in twenty didn't. Today, in Sainsbury's, maybe one person in twenty did. Poppies have been seized on by different ideologies and endowed with meaning which, if not necessarily in support of that ideology, is at least in opposition to the other ideology. It's reminiscent of the Flag of Saint George in the 1980s, which was appropriated by the far right as a racist emblem and only reappropriated courtesy of the England football team. Among certain people, wearing a poppy means you're a warmongering right-winger wishing to glorify sacrifice; among other people, not wearing one means you're a left-wing traitor who disrespects the armed forces. Either way, what was intended not to be a political symbol is increasingly becoming one. It doesn't help that every single public figure wears one when out and about. It looks awfully lot like there's a poppy police who will pounce when they see anyone step out of line, which means that those public figures who are actually wearing their poppy because they support what they believe it stands for are placed in the same "well they have to, don't they" category. It also doesn't help that what used to be made by disabled former members of the armed forces and lasted barely a week before it fell apart (kind of the point) is now commercialised to the point when you can buy things like poppy cufflinks that will last for decades. Peer pressure doesn't work on me, so I'm not put off by the disparaging looks I get at work from people who see wearing a poppy as incompatible with left-wing credentials. The reason I wear one is because if I had been drafted into the armed forces as a young man and sent off to kill other people my age who had also been drafted into the armed forces, in a war neither of us wanted to fight and at the behest of incompetent leaders, then I'd at least like to know that someone would remember me, as an individual, afterwards. They might not know my name or what happened to me or what I did, but they'll remember that people die in wars. If people do remember this, that lowers the chance of its happening again. I'm all in favour of that.